San Jose is the most local city to me. I must admit I have shunned it for the brighter lights of the vegan options in places like the East Bay but lately I have found some great vegan gems in San Jose. It's a good lesson to look closer to home even when you don't think it will offer much. Check them out because I think you will be pleasantly surprised. I know I was! Happiness Cafe is an all vegan cafe in a crazy busy Asian marketplace. It has a full food menu but the dessert menu is were it excels. For dinner we had the crescent rolls which were actually pretty good and the tofu strips with brown rice that was passable. They have quite a few vegan ice cream flavors for scoops but they also offer other options like cakes, sundaes, banana splits, and waffles with ice cream. My favorite is the banana split which you can see in all it's glory below. The food menu is ok but I recommend having dinner or lunch somewhere else and coming in for a glorious dessert. So good! Veggie Grill is one of my all time favorite restaurants. My two favs on the menu are the Buffalo Bomber and the Santa Fe Crispy Chicken but everything they serve is delicious. Veggie Grill is growing like crazy and they have locations opening up all over the place so more amazing Veggie Grill for everyone! Cutesy Cupcakes is a cupcake shop that usually has two or three vegan flavors every day. The place is super cute and the cupcakes never disappoint. The cupcake shown below is the cookies and cream which has a full size Oreo surprise inside. YUM! They have a pretty large list of vegan flavors that you can order for parties or if you just like to have your fridge stocked with vegan cupcakes. Not that I'm one of those people! Happy Hooligans is a smallish vegan restaurant that does a lot of things well and a few things amazingly. I've never hated a meal I've had there but only a dish or two have blown me away. My favorite being the Reuben. I am in love with this thing and it's really hard for me to try anything else when we go there. It's just THAT good! Also shown is the pesto fries, Backyard BBQ Burger, and the Fiesta Salad. Their desserts are pretty banging as well. 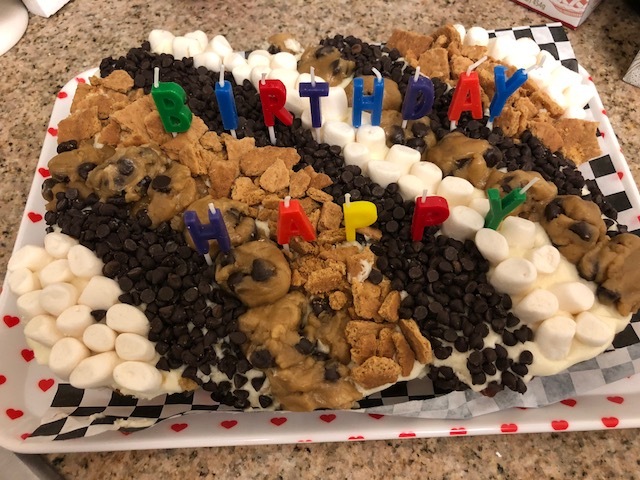 Make sure you try the S'mores pie for sure! 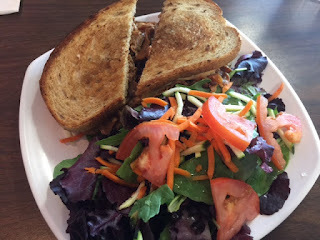 Happy Hooligans was the best secret in the South Bay vegan scene but with the crowds that are turning up there lately, it seems the secret is out! If you come at a peak meal time, be prepared to wait a while! 520 E Santa Clara St.
Vegetarian House is a all vegan Chinese restaurant that has tons of seating and is a great place for large groups. It has all of the usual items you would expect and all of them are pretty good! I usually get the Chow Mein and spring rolls and I'm always happy with them. The staff is always super attentive and friendly. Mint and Basil is a vegetarian Vietnamese restaurant where pretty much everything can be requested vegan if it isn't already. I've tried several of their rolls and the noodle dishes which I really enjoyed. Mint and Basil also has plenty of seating and some interesting decor that I quite enjoyed! 115 E San Carlos St.
Cinnaholic is now opening all over the country (there is even one in my hometown!) but I was very happy to see that a location opened in downtown San Jose. This saves me from making the trek to the original location in Berkeley. When my husband's birthday was approaching, I knew that their cinnicake would be perfect to celebrate with. I ordered the smallest option (6 buns) and went s'mores themed and added cookie dough for the heck of it! We also had chocolate dipping sauce on the slide. This cake was so decadent and I loved it. So happy that these amazing cinnamon rolls have come to the south bay! Vegan Veganos is a new food truck that is serving the south bay area with Mexican street food. I was really excited to try them as they are usually parked very close to my house! 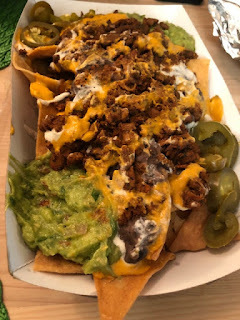 When we finally made it over we tired the Asada and Al Pastor tacos and the super nachos with house-fried corn tortilla chips, topped off with cashew spicy nacho cheeze, refried black beans, guacamole, cashew sour cream, jalapenos, and Asada. The tacos were pretty spicy, almost to the point that I couldn't enjoy them. I'm not a big fan of nachos but they were the stand out. Delicious! I'm very excited to try some of the other things they cook up in the future. 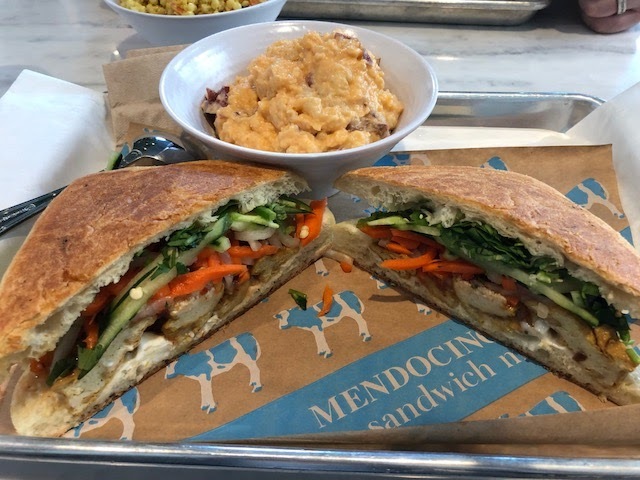 Matt and I were excited to try the new Mendocino Farms that opened near our house. A few of our friends had tried it and we didn't want to be left out! They have a clear but pretty small vegan menu but large enough to have some choice. 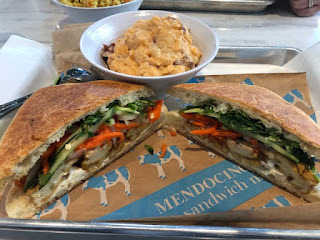 The ordering process is confusing the first time you go but once we figured that out, I ordered the Vegan Banh Mi with organic marinated, baked tofu with veganaise, sweet chili sauce, housemade pickled daikon & carrots, cucumbers, jalapenos, cilantro on panini-pressed ciabatta. 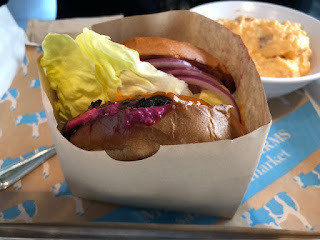 Matt ordered the Superfood Hemp Burger with vegan hemp seed house vegetable patty, spicy Chao tofu cheese, beet 1000 island, Scarborough Farm's butter lettuce, tomatoes, red onions, bread & butter pickles on a plant-based brioche bun. 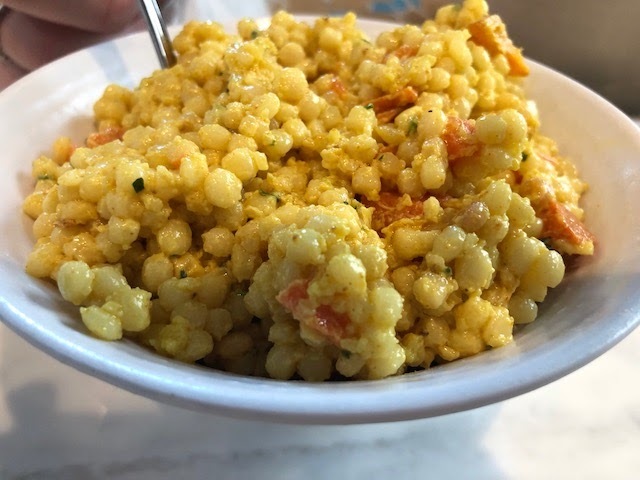 We also ordered the Curry Couscous and the potato salad. Everything was good but since everything I ordered was cold, I left feeling unsatisfied. That comes down to my ordering choices but it just didn't do it for me on the day. I think I'll try the cold offerings on a really hot day or try something these the next time I go. I really wanted to like Good Karma but it just wasn't to be. It's a vegan cafe and bar in Downtown San Jose. The first time we went there they were almost out of everything on the chalk board menu (not nothing marked sold out). We finally settled on something, I can't even remember what, and ate it without water as the water thingy was empty. I think we also had a hard time getting silverware as well. With this experience I was really for my first time at Good Karma to be my last but with my husband's urging we tried it again maybe a year later. The ordering process was much improved but the food still left something to be desired and it wasn't good enough for me want to come back and have it again. If you are in the area and in need of a bite to eat, it could work for you but it's for sure not one of my favorite places. What are your favorite vegan spots in San Jose? Let me know in the comments! Veggie Grill and Loving Hut!